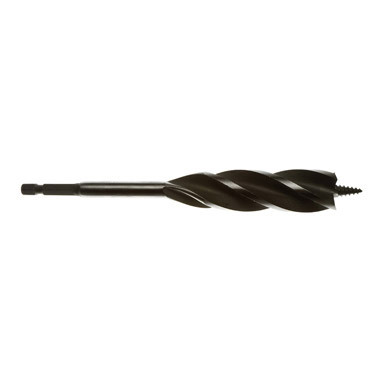 Armeg Nail Proof Wood Beaver 16mm Drill Bit - offers all of the benefits of the standard Wood Beaver drill bits but also features a new and improved bi-metal cutting head for increased lifespan when drilling into nail-embedded wood. This extremely durable cutting head ensures that Wood Beaver drill bits remain effective even if encountering nails in the drilling process. Wood Beaver auger drill bits feature four precision cutting teeth and four deep flutes for superb drilling balance, rapid drilling speed and efficient waste extraction. Wood Beaver drills bits are intended for use with cordless drills as their short, lightweight construction helps to maximise holes per charge. Wood Beaver drill bits feature a 1/4" quick-change shank for speedy tool change in the chuck or bit holder (apart from 32mm which has a 7/16" shank).